Finally a sign. A possible clue to where Wavechaser had come from. Runa had found the small dragon after a intense storm on her northern island. Wavechaser was different from the dragons on her island but she instantly felt a connection with her. Over the years they grew up together, were inseparable. But Runa could tell that Wavechaser sometimes felt lost....alone. They began trying to find more dragons like Wavechaser. After a long period of time they found their first clue on a distant sea stack. Was it possible there were more like Wavechaser? This was my submission to the diorama category at Crystal Brush and managed to win the bronze. It was a huge endeavour for me. I tried several new things for me including sculpting, different painting techniques, resin pours, etc. I was fortunate have several friends guide me through the process. I will be eternally grateful for their help. I hope you enjoy the piece. Wow !!! Absolut fantastic !!! 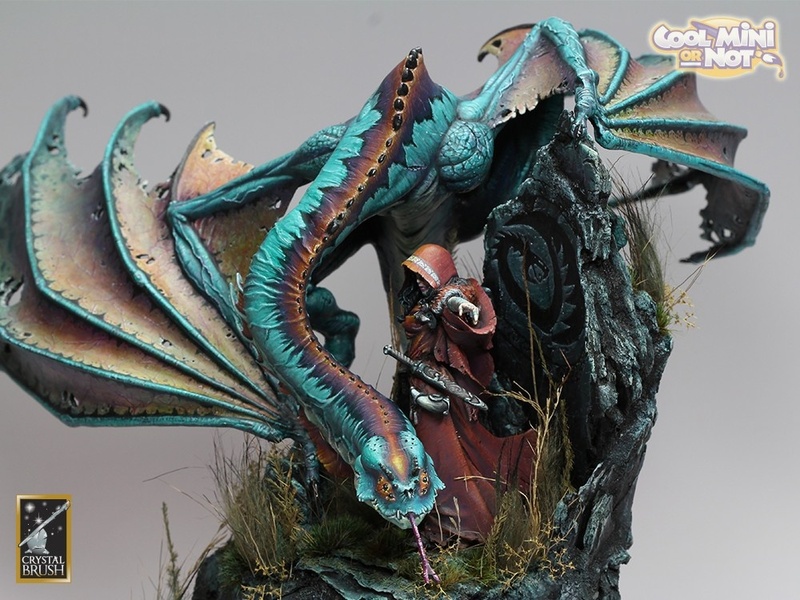 I love this entry for crystal brush, was great work! Amazing piece, was in my top 3 at the show. Your work is amazing. I can attest they’ll be plenty more crystal brush wins in your future. Your GOOD at this !!! Don’t ever give it up!!! Amazing mix of these miniatures to recreate a unique scene with a really good paint, love it! Reall great work! I like the models and the conversion, they fit very well and the equal colors work to see them as a team. The painting technique is brilliant. But even more I love the composition of the figure and the base, very harmonic and balanced. And 100% clean work in every detail. Top!! A smart combination of kits and a fantastic result! Thank you everyone for your comments. I appreciate them. Una auténtica maravilla. Una de las obras más espectaculares que he visto en tiempo. Beautiful colours, composition, I love it! All fits together, the “team”, the base, and the paitjob! Congratulations! a real masterpiece. This is one of my favourite dragons. It also gets my daughters seal of approval who is a dragon expert!